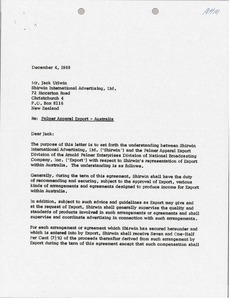 Switzerland - McCormack writes Jack Urlwin to inform him that he has instructed his comptroller, David Rees, to establish a bank account in Switzerland which will be used for establishing and operating the new office in Australia. 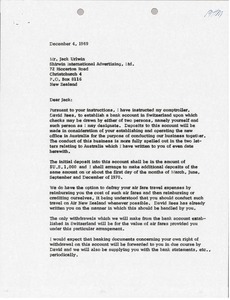 McCormack discusses the initial deposit to the account and how the account will be used. 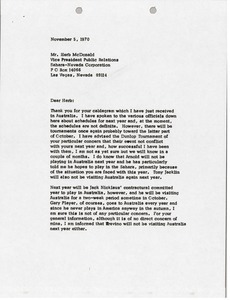 Australia - Noting that they need to make $200,000 on an Australian Triathlon. 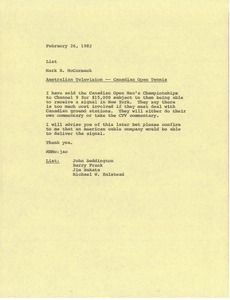 Australia - McCormack sold the Canadian Open Men's Championships to Channel 9. 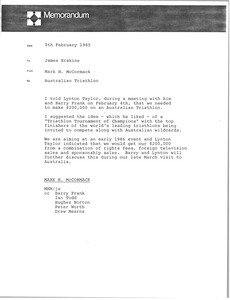 Australia - McCormack confirms Taylor's offer for National Football League coverage. 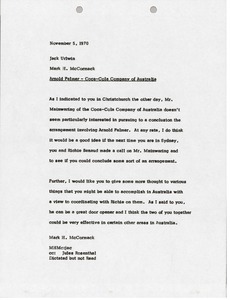 Australia - McCormack notes that Coca-Cola of Australia doesn't seem interested in pursuing to a conclusion the arrangement involving Arnold Palmer. 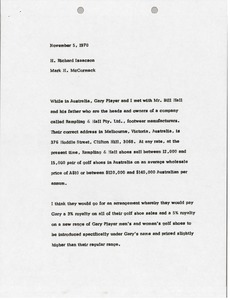 McCormack would like Urlwin's thoughts on various things that he may be able to accomplish in Australia with a view to coordinating with Richie beenaud. 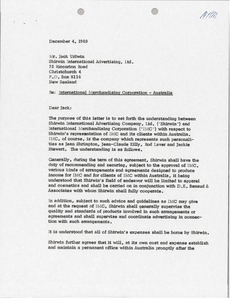 Australia - Arnold Palmer Enterprises writes Jack Urlwin to set forth the understanding between Shirwin International Advertising, Ltd. and the Palmer Apparel Export Division of the Arnold Palmer Enterprises Division of National Broadcasting Company, Inc. with respect to Shirwin's representation of Export within Australia. 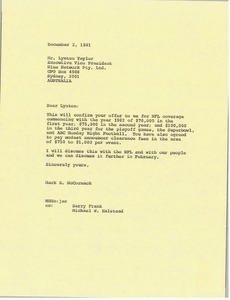 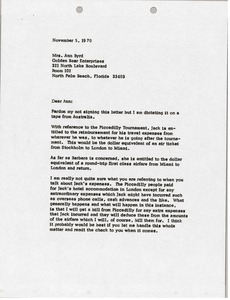 The agreement is explained throughout the letter.